In case Ping is success. When Ping is successful, it is displayed as follows. If you sent "ICMP Echo Request" to dst IP and are received "ICMP Echo Reply" from the IP, it is displayed as above regarded as success. 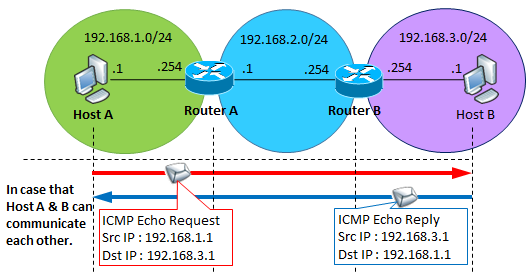 "Lost = 0" means "In response to ICMP Echo Request transmitted multiple times (default 4 times in the above example), any kind of ICMP packet was received each time". 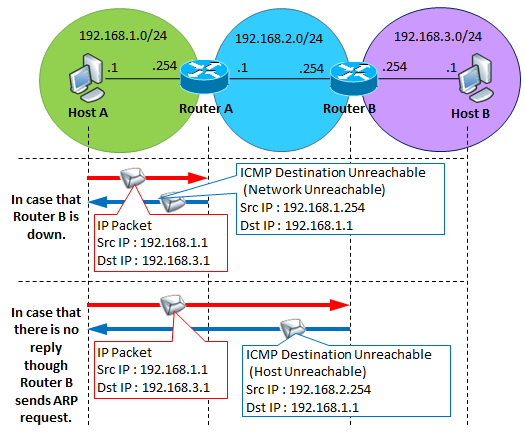 I will describe it later, Even if it is not the ICMP Echo Reply from the destination IP (even in Destination Unreachable), if any ICMP packet is received, it will not be counted as a loss. The cause depends on the displayed result.  If you can not understand below, please learn about the following two about ICMP. 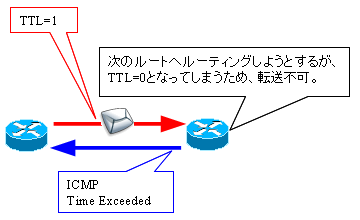 If this message is shown, it means "Although ICMP Echo Request was sent to the destination IP, the ICMP Echo Reply did not return for the timeout (default 3 seconds) elapsed"
In this state, it can not be determined whether ICMP Echo Request is packet loss in the middle of the route or ICMP Echo Reply is packet loss. It is because there is a part where communication does not pass through the firewall etc of the NW device, or the ICMP is stopped by Windows firewall, firewalld, security software on the opposite host side. Exceptionally, in the case of Ping within the same segment, it is displayed like this even if there is no ARP response from the destination host. 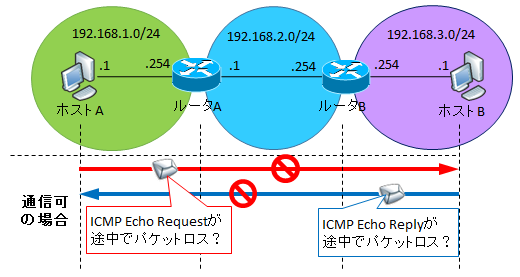 If this message is shown, it means "Although ICMP Echo Request was sent to the destination IP, but the "Host Unreachable" code in "ICMP Destination Unreachable" is returned from the NW device in the middle of the route (instead of returning the ICMP Echo Reply packet from the destination IP). Reply from 192.168.179.1: Destination Host Unreachable. Please pay attention to "Loss = 0". This is a problem of Windows expression, as mentioned above, it seems that it counts as reception if ICMP is returned and it is not counted as loss. An exception is the case where "Reply from" is its own IP in Ping within the same segment, except when the timeout (1 second) of the ARP Request is before the Ping timeout Internally ICMP Destination Unreachable is generated for itself, and it seems that the above display is done. If you add the option of -w 1001 (Ping timeout 1001 ms) to ping, "Request timed out" and "Destination host can not be reached" are seen alternately. Reply from 192.168.179.4: Destination Host Unreachable. This is displayed when Windows can not send an ICMP Echo Request, but the reason is unknown. Whether timing problems or applications of security software were suppressing transmission, there are a variety of causes. you change the IP of the interface while pinging with ping -t.
When routing, decrease the value of TTL field of IP header by one. When a TTL = 1 packet arrives at the router and further routing is required (when the destination IP address is not the NW address connected to the NW device), TTL = 0, and the packet is discarded at the NW device It will be. At the time when it is discarded, ICMP Time Exceeded is notified to the source IP address from the NW device. The cause of this case is usually a routing loop occurring somewhere. There is a possibility that "There are too many NW devices to go through", but now it is a good level to think that it is impossible. If you want to check the occurrence of the routing loop, use tracert to investigate. pathping, which Windows install default, is useful tool.